My Newsagent always has pictures of pussies on the top shelf. 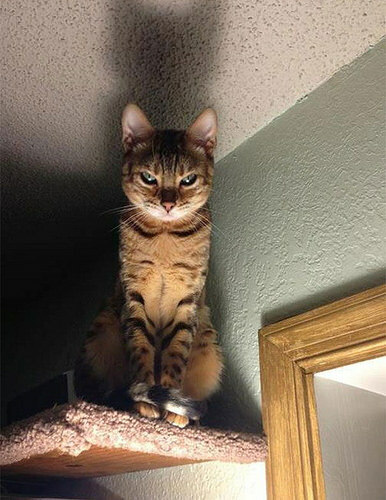 "For the last time, Phoebe, we are not getting a cat, so you can shelve the idea"
I am plotting the details of your death. Ikea offers storage solutions for everything. With 8 of his 9 lives down, Tiddles was taking no precautions in extending his shelf life. "Nobody puts tabby in a corner." "I'm not coming down until you tell me what you've done with my back legs." I spy with my little cats eyes. I don’t know the name but the face looks familiar. 'I can't jump down, I've got my tail caught round my legs'. "I wil wait for the to go to sleep and then i will Pounce." Pussies always look better in a half light. "I looked up that N-word you keep spelling to your boyfriend when I'm in the room, Cruella." "What makes you think we might have mice in the loft, darling?" The cat that got the scream. "..and I've been teaching him a few words. Here, watch this...COLONIC IRRIGATION !" "He looks shelfy enough to me." He sits on that shelf in the attic bedroom because he just loves the down-stares. "No cobwebs in this corner. I'd like to see you try it, Spider." My cat should be a member of Mensa, he's so bright.